We have just launched a search for Bradford residents to become Literacy Champions in their local communities, as part of our Bradford Stories campaign. Literacy Champions are local volunteers who want to make a difference in their area. The initiative aims to tackle Bradford’s literacy issues at a community level, by empowering local people to improve the literacy of those around them. A recent study we conducted with Experian found that Bradford is at high risk of literacy issues. Bradford East is ranked 36 out of 533 constituencies in England for literacy vulnerability, where 1 is the most in need of literacy support. Bradford East, South and West constituencies are in the top 15% of greatest literacy vulnerability in the country. The Bradford Stories campaign, which is delivered by us and supported by Bradford City Council, aims to raise literacy levels in the city through a range of projects and activities to promote reading, writing and storytelling. The Literacy Champions project will involve 50 volunteers from a diverse mix of communities across Bradford. They will be given training and support to empower them to create and deliver literacy activities in their local communities. The Literacy Champions’ projects could include setting up a reading group for adults or children, planning a literacy-based outing or competition, or helping families get involved with their local library or children’s centre. 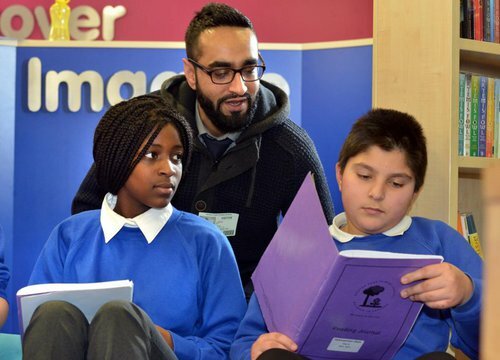 Find out more about how to become a Bradford Literacy Champion.